It’s easier to get targeted views once your video is ranked high on Google search results. But this requires an understanding of how YouTube videos work for Google. If you chose YouTube as a platform to upload your video, it is already showing up higher than other video platforms’ similar videos. But we still need to learn the life cycle of YouTube marketing with: How to- create the right content for YouTube, technically optimise your video to rank, and distribute your video to rank. You must be aware of this but if you need to be reminded… The first and foremost thing to do is create a great video content that drives awareness for your brand and traffic to your channel/site. If you have a massive YouTube following all you’ve got to do is publish great content and the rest will take place on its own. But what if you don’t? As many successful YouTubers say, the First Million is the hardest. If might seem easier but if you’re not a Marina Joyce, you need to put your sweat and blood for hitting that first million, and before that, getting the kind of viewers you want on your first few videos. 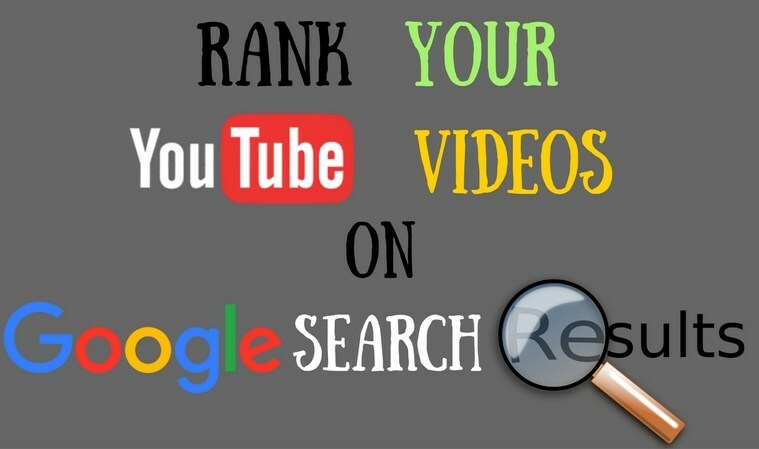 Which is where the following YouTube and Google ranking factors come in place to help you out. This is where most people fail- in the videos they’re creating. People on YouTube are seeking content to help them solve problems, learn skills, watch cat videos and waste time. So focus on your content accordingly. The thing is Google believes videos are the best way to answer a search query like How to do This, IPhone 7 Features and Review, Smokey Eye Makeup tutorial. And it’s okay if you can’t do that, just share your knowledge about any industry. When YouTube first launched the aggregate video views played a huge role in ranking. As in, the more views your video got, the higher it would rank. But YouTube keeps changing it search algorithm, making it worse initially (IP blockers, click baiting, and results full of spam). But it realized this mistake quickly and started taking engagement factors into account. While aggregated clicks are still counted, the amount of engagement on your videos play a huge role like the likes, dislikes, comments, watch time, shares, views on other sites, engagement on other sites. This required YouTubers to create better videos with more engaging content in order to rank higher. Make your videos at least at least 2 minutes in length; it’ll be really good if it’s 10 but don’t compromise the quality for Watch Time. If your viewers are engaged in your video for a longer duration, your videos will rank better. But if you’re just stretching your videos for this, you won’t be able to keep a user on your video and they won’t rank well. So, having videos with more length will add to the total seconds users spend on your videos but combine that with great content and ensure that user WILL spend time on your videos. Of course, you need to optimise your Video Title for YouTube with smart keyword selection. And yes you target long tail and less competitive keyword which will allow you to rank your video for free. But like the page SEO and image optimisation, the search engine looks at the name of your raw video file. Which is why I said, ‘Video Name’ and not Video ‘Title’. 1. Select finished video file that you will upload. Rename the file Video Title. 2. And then right click on the file and select “Get Info/Properties”. 3. Then go to “Details”. 4. Add some tags related to the content. 5. Under “Title” or “Name & Extension”, name the file which includes your top 2 keywords. And that’s it! You’re all set to upload your file on YouTube! When you dump the file in the upload section the raw video name will pull through – leave it as is. This is the title you want for your video. Add a link to your website. If you don’t have a website, link your blog or social networks. Your videos might be amazing but you need to “Call to Action”. Drive people to your website and you’re your business. If your YouTube channel is your only business, call out your social profiles. After adding links, optimise the rest of your video description. It is detected by search engines because it wants to know what your video is about. -Make it at least 200 words. -Use synonyms for your keywords. -Write a different description for each video. Or it’ll go down as duplicated content. -Don’t stuff keywords or you won’t rank. -Write out the video transcript using some software. Playlists add an extra ranking factor to your video. Create a new playlist using synonym keywords for each video. Also, it will organise your videos and make things easier for viewers and you. Thumbnails aren’t an added ranking factor but it affects video engagement. Adding a custom thumbnail to your video can improve your click through rate (CTR). And if your video content is engaging enough, the Watch Time of your video will increase, making it reach a higher rank. YouTube lets you choose 1-3 randomly chosen screenshots from your video. These are often unappealing pictures that just won’t get clicks. Take the best moments from your video, add text, and use bold colours that will stand out on Google. On-page SEO– As in how your website is structured, image tags, keyword density, tags, etc. Off-page SEO– Other domains that link back to your website. Relevance– As in how many people found it helpful. This is measured by Social media engagement, like how many people liked it, shared it, etc. Make this process easier by syncing your YouTube account with your social media accounts, and post your videos on your profile and relevant pages. YouTube sees a channel without a profile picture, header, description and links as spam. It is an additional ranking hack, adds a pop to your channel, and can show what your videos are about. -Add links to all your social media accounts. -Add a nice and relevant channel image and banner. -Write a long description in the about section (include synonym keywords). For beginners trying to understand SEO, stick with low competition/long tail keywords. The hacks laid out above will rank any low competitive or long tail keyword. If you want to rank your video for added competitive terms you have to embed the HTML on other sites and build links to your video. When a powerful platform like YouTube is used well, it can get a lot of organic traffic to your website/channel. Read and follow the steps in our related articles as well and see a clear and immediate rise in your rankings.